They are close relatives, with all the same symmetries... but what excites me most is that they have 5-fold symmetry. It's a theorem that no crystal can have that kind of symmetry. So, we might wonder whether these shapes occur in nature... and if they don't, how people dreamt up these shapes in the first place. the golden ratio is not terribly far from 2. So, the pyritohedron is a passable attempt at a regular dodecahedron. Perhaps it was even good enough to trick the Pythagoreans into inventing the real thing. If so, we can say: fool's gold made a fool's golden ratio good enough to fool the Greeks. and so on. So, in theory, we could use these ratios to make cubical crystals that come closer and closer to a regular dodecahedron! 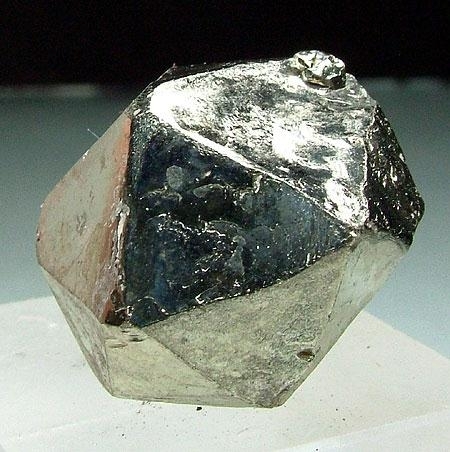 Has anyone ever seen a 5/3 pyritohedron? That would be even better. 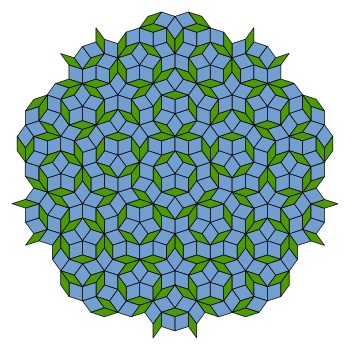 It would be quite hard to distinguish by eye from a true regular dodecahedron. 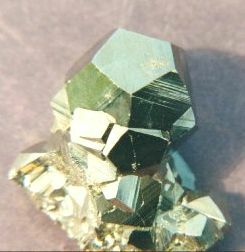 Unfortunately, I don't think iron pyrite forms such subtle crystals. Okay. End of digression. But there's another trick we can play! 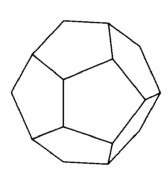 besides being at right angles to the faces of the dodecahedron, are also the corners of the icosahedron! the five so-called Platonic figures which, however, do not belong to Plato, three of the five being due to the Pythagoreans, namely the cube, the pyramid, and the dodecahedron, while the octahedron and the icosahedron are due to Theaetetus. So, maybe Theaetetus discovered the icosahedron. 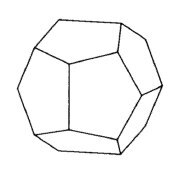 Indeed, Benno Artmann has argued that this shape was the first mathematical object that was a pure creation of human thought, not inspired by anything people saw! • John Baez, Who discovered the icosahedron? But right now I want to head in another direction. 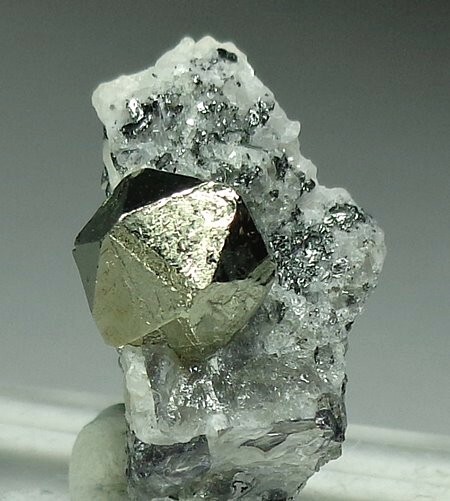 It turns out iron pyrite can form a crystal shaped like a pseudoicosahedron! And as Johan Kjellman pointed out to me, one of these crystals was recently auctioned off... for only 47 dollars! So: did the Greeks ever seen one of these? Alas, we may never know. 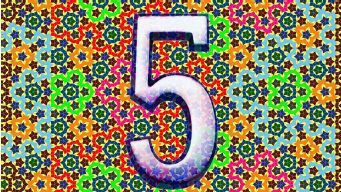 John Baez, My favorite numbers: 5. John Baez, Tales of the dodecahedron: from Pythagoras to Plato to Poincaré. John Baez, This Week's Finds in Mathematical Physics, "week241" and "week283". Ian O. Angell and Moreton Moore, Projections of cubic crystals, International Union of Crystallography. The gray bar on top is 10 nanometers long, while the bar on bottom is just 5 nanometers long. 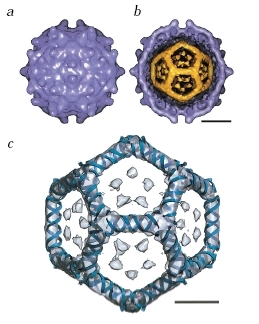 Reidun Twarock, Mathematical virology: a novel approach to the structure and assembly of viruses, Phil. Trans. R. Soc. A 364 (2006), 3357-3373. 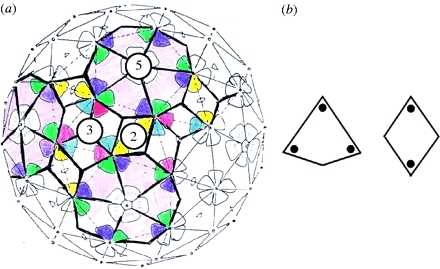 Thomas Keef and Reidun Twarock, Affine extensions of the icosahedral group with applications to the three-dimensional organisation of simple viruses, J. Math. Biol. 59 (2009), 287-313.